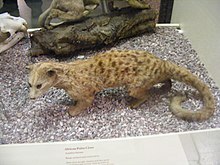 The African palm civet (Nandinia binotata), or 'two-spotted palm civet', is a small mammal. It is in the Feliformia suborder. It has short legs, small ears, a body like a civet cat, and a long lithe tail as long as its body. Adults usually weigh 1.70 to 2.10 kg (3.7 to 4.6 lb). It is native to the forests of eastern Africa and the Congo River basin. It usually lives in trees, and it is omnivorous: it eats rodents, insects, eggs, carrion, fruit, birds and fruit bats. The animal is generally solitary and nocturnal. Although it looks like other civet species (in the family Viverridae), the African palm civet is genetically distinct: they probably diverged from other civets before the cats did. They are therefore classified as the only species in the genus Nandinia and in their own family, Nandiniidae. However, not all experts accept this. Wikimedia Commons has media related to African palm civet. This page was last changed on 8 October 2017, at 17:16.